At an event in Mountain View, CA, and watched by fans via live stream on YouTube, Google announced a slew of new products today. Over the last few weeks, there was no shortage of rumors and leaks about what might be unveiled, but now the secrets are out. As expected, Google has announced the new Pixel smartphones to replace the Nexus line. The new devices, which currently come in two sizes yet share every specification but display size, are Google-branded with a "G" logo despite being manufactured by HTC. This is a major departure from the tradition of partnering with companies like Huawei or LG for each generation of Nexus phones. As you can see from the specs below, Google is not pulling their punches with this debut offering. The biggest news spec-wise is that the devices will both be running on the Snapdragon 821. As I mentioned in the rumor roundup last week, this means that the Pixel and Pixel XL will be the first devices to be fully capable of running apps designed for the Daydream View virtual reality headset. It also means that Google's own devices are just that much better than the flagship devices launched this year by pretty much all of their partner OEMs, most of which have Snapdragon 820 chips. We also see that the devices will feature USB Type-C ports with a fast charging technology, likely Qualcomm's Quick Charge considering it comes as a standard option on the Snapdragon 800 series processors. Thanks to this technology, just a 15-minute charge provides up to 7 hours of battery life. Additionally, the specs section claims that the 3,450 mAh battery (Pixel XL) will enable 26 hours of talk time and 456 hours of standby. Beyond just the hardware numbers, Google is leveraging its unique position as creator of the Android OS to deliver a cohesive user experience with software and features that their competitors will be hard-pressed to match. Among these are photo features like Smart Burst, Smart Photos, and unlimited cloud storage. Unsurprisingly, both Allo and Duo, Google's recently launched messaging apps, are front and center, as is Google Assistant. Pixel will be the first phone with Google Assistant built in. This means that with a hot word and voice search, Google Assistant is there and ready to offer up information or help with tasks such as scheduling, finding relevant information like nearby restaurants or events, or pulling up photos from a specific time period ("show me my photos from last October"). During the demo, the Google Assistant was able to take basic voice inputs and make cognitive leaps based on the context of past searches and even what's already on your screen. When Sundar Pichai took the stage at the start of today's event, he got straight to the point: Google wants to give us an AI-first world. To this end, Google Assistant—with its impressive capabilities to understand natural human language—will be your own, individual "personal Google." When Apple announced Siri a few years ago, it was a lot of hype that never quite reached its potential. Of course, we've come a long way since then, and there are a number of virtual assistant offerings available—but none have Google's deep data pockets to pull from. With all the boast and brag from last month's iPhone 7 launch, there are some people at Apple who are likely grinding their teeth at the moment. DxOMark Mobile, an industry standard for camera ratings, gave Pixel a score of 89, whereas the iPhone 7 only got an 86 (though, they haven't rated the iPhone 7 Plus yet). So, yeah, at least for the moment, this really is the best smartphone camera ever made. 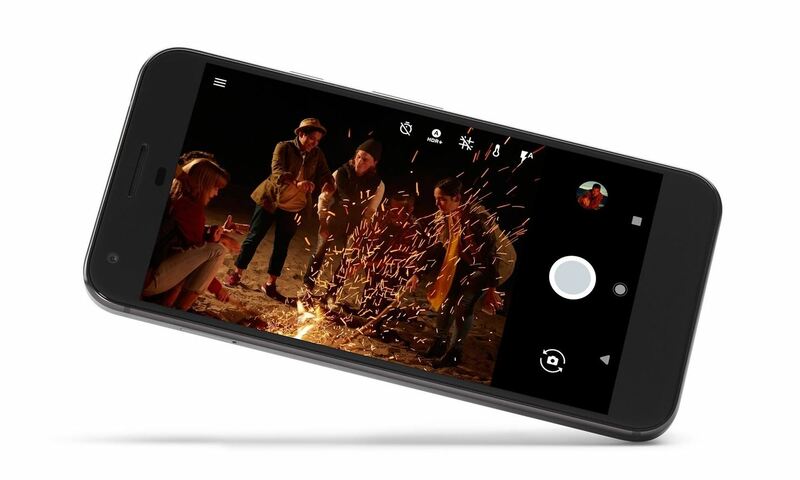 And with a shorter capture time than other smartphones and the rest of the built-in photo/video package—like Smart Burst, HDR Plus, and that beautiful video stabilization feature—Google is setting a high bar for next year's flagships. Pixel also comes with Google Photos built in to store and organize photos. This means that Pixel owners will get free (yep!) unlimited storage for photos and videos at their original full resolution—including the 4K videos that these devices are able to capture. Considering how much space is taken up by images and videos on our phones, a device whose selling point is "no running out of space" is a pretty big deal. The Pixel phones will come in three colors: Quite Black, Very Silver, and Really Blue. They will work on Project Fi and are available for preorder in the US beginning today, starting at $649 (or $27/month) on Google Store. They're also available from Verizon Wireless. Included in each box, you'll also get a OTG adapter that makes switching from iPhone insanely easy, and each device comes with 24/7 live customer care. Will you be making the switch to Pixel? Tell us why or why not in the comments.